← How Can Innovative Technology Make Conflict Prevention More Effective? In 2008, police forces across the United Kingdom (UK) launched an online crime mapping tool “to help improve the credibility and confidence that the public had in police-recorded crime levels, address perceptions of crime, promote community engagement and empowerment, and support greater public service transparency and accountability.” How effective has this large scale digital mapping effort been? “There continues to be a lack of evidence that publishing crime statistics using crime mapping actually supports improvements in community engagement and empowerment.” This blog post evaluates the project’s impact by summarizing the findings from a recent peer-reviewed study entitled: “Engagement, Empowerment and Transparency: Publishing Crime Statistics using Online Crime Mapping.” Insights from this study have important implications for crisis mapping projects. A related study found that people’s opinions on crime levels were “heavily influenced by media depictions, demographic qualities, and personal ex- perience.” Meanwhile, “the countervailing source of information—nationally reported crime statistics—was not being heard. Simply put, the message that crime levels were falling was not getting through to the populace over the cacophony of competing information.” Hence the move to publish crime statistics online using a crime map. In addition, the presentation of “crime statistics on the national website is very passive, offering little that will draw people back and keep them interested on crime trends and policing in their area.” For example, the project did not require users to register their email addresses and home post (zip) codes when using the map. This meant the police had no way to inform interested audiences with locally relevant crime information such as “specific and tailored crime prevention advice regarding a known local crime issue (e.g. a spate of burglaries), directly promoting messages of reassurance and used as a means to publicize police activity.” I would personally argue for the use of automated alerts and messages of reassurance via geo-fencing. (The LA Crime Map provides automated alerts, for example). I would also recommend social networking tools such as Facebook and Twitter to the map. 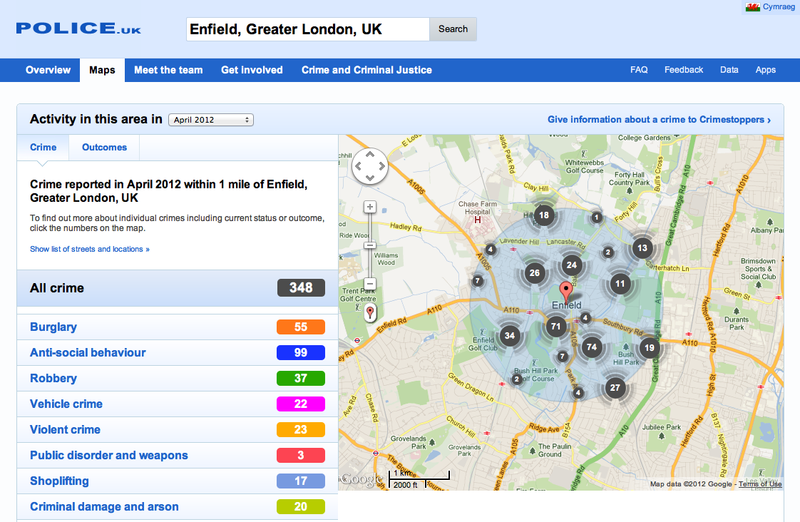 Is Crime Mapping the Future of Crisis Mapping? 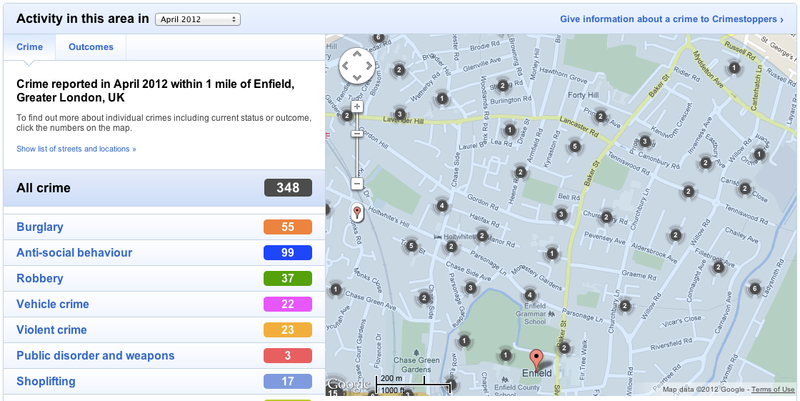 This entry was posted in Crisis Mapping, Crowdsourcing and tagged Crime, mapping, Police, UK. Bookmark the permalink. Good take away … “must avoid becoming an exercise in promoting political transparency when the data it offers provides little that encourages the public to react”. Publishing open data is necessary but not sufficient for “engagement”. My only concern reading this would be evidence for pulling back and not releasing crime statistics … which on their own may not be effective for general public communication, but are still vital in themselves for civil society and software developers focusing on this area. This analysis should be a prompt to do more, not less.